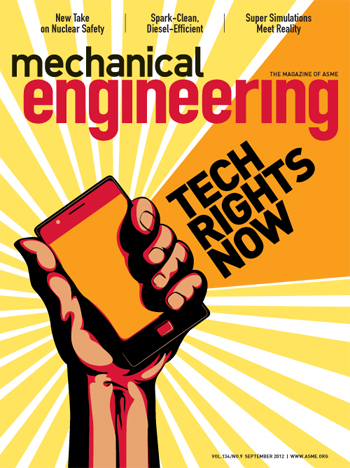 My September column in Mechanical Engineering magazine. Last month I was invited to a midnight party that was out of this world. NASA was hosting the party—a public vigil for the landing of the rover Curiosity on the surface of Mars—at the iconic Times Square site in New York City where revelers wait for the year to change every December 31. I decided to skip the public celebration but stayed up until the wee hours, nonetheless, to watch the event live online at home. I was not the only one who tuned in, as NASA’s websites ultimately crashed due to the high volume of overnight space gawkers. And why wouldn’t people tune in? The 10-year project, with a price tag of $2.5 billion, featured an impossibly complex rover and landing system. If you’re not familiar with it, see the video here. Still, this project hasn’t garnered the type of buzz this year’s Olympics enjoyed. Maybe there’s no gee-whiz left in us anymore and we’ve grown used to seeing things we never thought we would see, but—putting politics and finance aside—landing a rover the size of a car on Mars is a spectacular engineering feat. If the public interest surrounding this remarkable achievement was subdued, the mood among engineers and scientists at the NASA Jet Propulsion Laboratory was not. When Curiosity landed, they were whooping it up as though their own kin had won an Olympic medal. In fact, mechanical engineer Adam Steltzner—who led the team that designed the system and has become the prominent face of the project—said he felt the project has become like nurturing the development of a child. Steltzner, a former rocker, has become a bit of a celebrity in his own right. He is comfortable in front of the media, sports an Elvis haircut, and has pierced ears. The Bay Area native told National Public Radio a couple of days before Curiosity landed that engineering gave him the “opportunity to be gainfully employed, really understanding my world with these laws and equations that govern it.” He’s become so popular, in some circles, that there’s an active blog discussion on whether Steltzner is truly a hipster or not—some claim his perfectly coiffed hair disqualifies him. Supporters of planetary exploration argue strongly that Curiosity represents more than a search for any life Mars might harbor; but that it also signals to the rest of the world that U.S. engineering is thriving. As of this writing, Curiosity was successfully sending back signals from Mars. Wyndham is focused on the rights of people living in rural areas and developing countries to access state-of-the-art technology. Engineers working at the Jet Propulsion Lab will tell you that Curiosity is, in its own right, an important tool to give engineers on Earth access to insights that will lead to breakthrough technologies. Technology, they say, that will lead to a better way of life, on Earth, for all.